Yet when you look at a high-resolution image of these relics from the early universe, you'll find a sprinkling of hot, massive, apparently young blue stars! Is there a stellar fountain of youth inside? Kind of! These massive stellar swarms are so dense — especially towards the center — that mergers, mass siphoning and collisions between stars are quite common. When two long-lived, low-mass stars interact in these ways, they produce a hotter, bluer star that will be much shorter lived, known as a blue straggler star. First discovered by Allan Sandage in 1953, these young-looking stars arise thanks to stellar cannibalism. 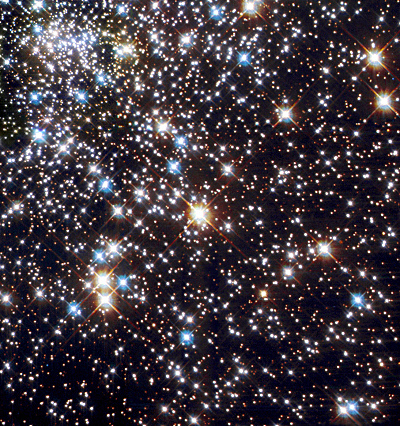 So enjoy the brightest and bluest stars in these globular clusters, found right alongside the oldest known stars in the universe!